With Pranab Mukherjee, an acknowledged man of letters, moving into the Rashtrapati Bhavan as President, the library is being dusted and brought back into shape. And the oldest book in the collection, dating back to the year 1800, is on the Tiger of Mysore, Tipu Sultan, or Tipu Sultaun as he is spelt on the cover. 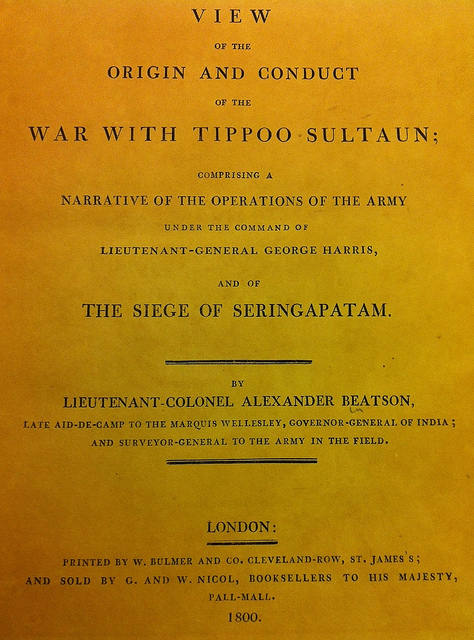 The book, by Lt Col Alexander Beatson is a narrative of the operations of the army under the command of Lt Gen George Harris that resulted in the overthrow of Tipu and the discovery of his body at “Watergate”. 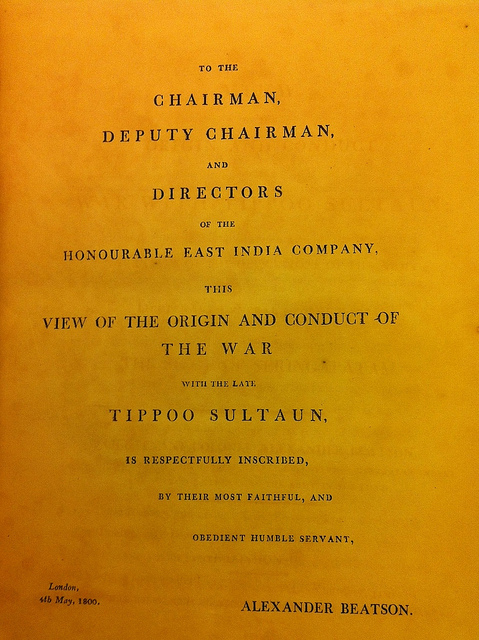 The book was prepared for the attention of the chairman and directors of the East India Company. 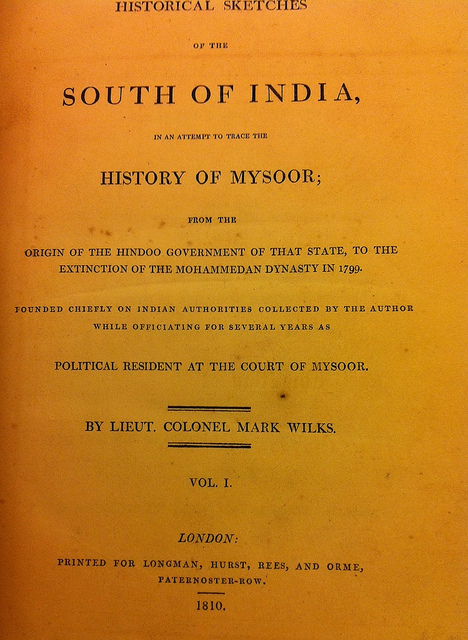 The President’s library also boasts of an 1810 volume that contains “historical sketches of the South of India” in an attempt to trace the history of “Mysoor”, from “the origin of the Hindoo government of that state to the extinction of the Mohammedan dynasty in 1799″, with the downfall and death of Tipu Sultan. This entry was posted in Issues and Ideas, Literati, Media, Mysore-Bangalore and tagged Churumuri, George Harris, Hindoo, Mysore, Pranab Mukherjee, Rashtrapati Bhavan, Sans Serif, Srirangapatna, Srirangapatnam, Tipu Sultan, Tipu Sultaun. Bookmark the permalink. After reading this I am prompted to go to our very own maharaja college library. .and find out about the old collections it has…. Tippu was a coward and it was proved by eminent Kannada histologist Chidanandamurthy. There is no need the title “Tiger” for a “Coward”. Very surprised to see these books still remaining in the President’s Library! I thought Prathibha had filched all valuables from the President’s House! 5000 years of Indian History and the oldest book in the Presidential Library is just 200 years old. SHAME! SHAME! Unfortunately, the Presidential Palace itself is a British creation. And its contents are therefore bound be from their times. Sad that instead of turning it into a museum to remind us of our horrific past, our masters just changed the name and slipped into it. The Union Govt. and the Presidency should take a lesson from Karnataka. It is said that Kengal Hanumanthaiah, the second CM of Karnataka, visited the Viceroy’s Palace (todays R. Bhavan) as he had heard a great deal about its architectural marvel. After seeing it, he decided to build a rival for it in Karnataka. I’m not sure if it is possible to compare Rastrapathi Bhavan and Vidhan Soudha, but I’m proud of the latter as it was built by Indians in Independent India. P.S. : I guess RSS and Shiv Sena haven’t heard this fact yet! A few details will be in order. I heard then almost every day, stories emanating from those who were involved in this Kengal’s Vidhana Soudha project. First. the construction cost began escalating in geometric progression; second, the contractors involved were strongly rumoured to be Kengal’s donors for a variety of his pet projects in his Kengal village, his election funds, and were really his close friends; third, there were many who were rumoured to have made enormous amount of money by the bloated budget,and that rumoured to have included Kengal himself. It was not made out to be a grand project sans scandal. Let us face it, I as a Mysorean then resented very much the move of Akashvani to Bangalore by Kengal who was not a lover of Mysore. Like many many others, I was not proud of this expensive edifice either. If some one is interested in the reminding of “the horrific past”, I am ashamed to hear about the pathetic and disgraceful present this country has become. I should have also said that Mysore lost its place as the capital city. Kengal’s hatred of Wodeyars was well known. Yes. I do agree that there would have been corruption in a large project like V. Soudha. Didn’t the British use money generated from Indian toil to build the Rastrapathi Bhavan? Corruption is an inveitable part of democracy. I have noticed this both in UK and USA while I lived there for few years. The issue is delivery; what you get for the money you lose. Just look the basic civic structure today. Electricity wires are dangling from every pole. The footpaths are broken, with stone slabs in wavy unwalkable geometry, cobble stones are missing, bus stop is right in the middle of the foothpath practically blocking pedestrians from walking thorught it; add transformers, smelly toilets, police chowkis etc which are all built right in the middle of foothpath. Then add garbage pile every 10 yards. Isn’t money being drawn in the name of upkeep of these structures? Have you looked at the expenditure budget of our municipalities? There cost to corruption is definitely several magnitute higher than that of Vidhana Soudha. Despite that much peilferage what have got? nothing! For the olympics, Chinese built inspirational stadiums. In contrast, what we built for the Commonwealth Games was perspirational. The stadiums were drab and dirty and afoot bridge collapsed a day beofre the game. Your dislike for V.Soudha is emotional and its completely justified. As a Kannadiga born and raised in Bangalore, I’m just surprised that such a grand public delivery was possible by a local politican! 1. How many times have to great Mysoreans elected Srikantadattanarasinharaja Wadayar for legislature/parleiament? He has prety much lost every election he has contested. 2. You have now sent Siddaramaiah to lead the State. Hasn’t he practically destroyed the Wadayar family with the Palaces Acquisition’s Act? 3. In the 60s my mother and uncle lived in Mysore for education. During Dasar they would often hear you great Mysoreans say to little children: ” Nodoo, nodoo. Anemele ambari. Ambari melondu ane “. 4. During an eveing stroll near the Palace, my mother and uncle happend to be at an eavesdropping distance from a group of priests. They were returning from a feast at the Palace. At the time of adieu, Maharaja Jayachamarajendra Wadayar had fell at their feet and sought thier blessings; One of them has blessed him verbally but in his mind had wished for his complete destruction (sarvanasha). I have never seen a bigger namakharami than a mysorean. 5. Despite being born post independence and away from Mysore, I hold great respect for the Wadayar Dynasty. What ever developement we see in South Karnataka is becasue of thier benevolent rule. Look at Hyderabad-Karnataka, which has been squeesed dry by the Nizams. The only king in India’s history and a handful in world history to force British to end a war on his terms; born and died on the battlefield in the blessed land of Mysore. The ‘tiger’ will continue to inspire anti-Capitalist and anti-Imperialism forces for centuries (unlike ‘yes masters’ of the British Empire).